For other types of football in Ireland, see Gaelic football, Rugby union in Ireland and Rugby league in Ireland. 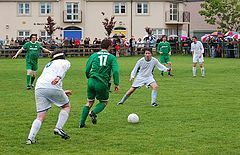 Association football (Irish: Sacar) also known as soccer or just football is the team sport with the highest level of participation in the Republic of Ireland (with five-a-side games being included). It is also the third most popular spectator sport overall with 16% of total attendances at sports events, behind only Gaelic football (34%) and hurling (23%). The national governing body for the sport is the Football Association of Ireland, which runs the national football team and the League of Ireland, which is the top level of the sport in the country. The term "football" is used interchangeably in Ireland between association football and Gaelic football. Rugby union, another popular type of football is generally called "rugby", while rugby league, Australian Rules football and American football are niche and minority sports usually referred to by their long title. For spectators in Ireland, English football is extremely popular compared with the domestic league, with up to 120,000 Irish fans travelling to watch games in the UK each year. Irish school children are commonly seen wearing replica shirts of English league teams. In addition two Scottish football clubs with strong Irish roots, Celtic F.C. and, to a lesser extent, Hibernian F.C. maintain strong followings in Ireland. In its earliest days, association football was largely confined to the city of Dublin and its surrounding county. Gradually it became more widespread throughout the country, to the point where in the modern day there are clubs in all of the counties of Ireland. Currently, average league attendances at matches in the League of Ireland is around 2,000. Many of the country's top players move to leagues outside of the country, particularly the Premier League in England, which is one of the reasons why significant numbers of locals follow clubs in that league. Having said that, the best Irish players have always followed the best wages. This did not stop the game entering into a "golden period" after the second world war when grounds would be full every weekend to watch a league game. It was the start of televised football in England, and the amateur setup in Ireland, that led to a decrease in attendances and a lack of support for the home teams. The sport is played at all levels in the country. The national team's performance in the 1990 FIFA World Cup, where they reached the quarter-finals is their best to date. Although the sport was being played in Ireland in the 1860s, it was mainly based in Ulster and it was not until the 1880s that the game spread to other areas of the country. The Leinster Football Association was formed in 1892 as the game became more popular in the area. Clubs from outside the Belfast area thought that the IFA favoured Ulster based clubs and when the IFA reneged on a promise to play the Irish Cup semi-final replay in Dublin and instead scheduled the match for Belfast a meeting of southern associations and clubs was arranged and on 1 June 1921, the Football Association of Ireland (FAI) was formed in Molesworth Hall in Dublin. The League of Ireland was established in 1921, with eight teams taking part. St. James's Gate F.C. won the first title, and they were also winners of the first FAI Cup, then called the Free State Cup, in 1922. In 1923, the FAI was recognised by FIFA as the governing body of the Irish Free State under the name Football Association of the Irish Free State (FAIFS) and at the 1924 Olympics, the Irish Free State made their international debut. On 28 May at the Stade Olympique, they beat Bulgaria 1–0, with Paddy Duncan scoring the team's first ever goal. As a result of this they qualified for the quarter-finals. On 14 June 1924, the Irish Free State made their home debut against the United States, who had embarked on a brief European tour after competing in the same Olympics. Ed Brookes scored a hat-trick in a 3–1 home win at Dalymount Park. The Irish Free State did not play their next game until 21 March 1926. This was an away game against Italy which they lost 3–0. In subsequent years the status of the Olympic Games football competition was downgraded and as a result this game is widely regarded as the Irish Free State's first official game. The 1930s saw the erosion of Dublin's dominance in the league. During the 20s, Bohemians, St James's Gate, Shelbourne and Shamrock Rovers had a monopoly over the domestic game, but Dundalk and Sligo Rovers both won championships while Cork F.C. and Waterford collected FAI Cups as football spread to the provinces. The Second World War curtailed international matches between 1939 and 1946, but league football went ahead with Cork United F.C. dominating, winning four titles between 1940 and 1945. On the international front, England won a match at Dalymount Park 1–0, but Ireland got their revenge three years later when they became the first 'foreign' side to defeat England on English soil. Ireland won the Goodison Park encounter 2–0. In 1950, FIFA directed both the FAI and IFA to pick players only from within their own boundaries rather than picking players from all over the island. FIFA also ruled that the FAI's team would be known as the Republic of Ireland with the IFA's side being called Northern Ireland. Up to that point, both Associations referred to their teams as 'Ireland'. The Dublin based clubs reasserted their dominance with only Cork United capable of challenging their dominance. 1958 saw a League of Ireland side enter European competition for the first time with Shamrock Rovers going out 9–2 on aggregate to Manchester United in the first round of the European Cup. In the 1960s Waterford United became one of the league's most successful clubs as they won three titles during the decade, though Shamrock Rovers were the team of the 60s. The Hoops won six FAI Cups in a row during the 60s, a feat that has never been repeated. In 1969 the FAI decided to appoint a national team manager instead of a team of selectors. Mick Meagan became the first manager. They still failed to win any of their qualifiers for the 1970 World Cup. Ireland finished bottom of their qualification group for the 1972 European Championship, ending Meagan's tenure as manager. Liam Tuohy briefly replaced him. Johnny Giles became the Republic of Ireland's first ever player-manager before the 1976 European Championship qualifiers, but the side again failed to qualify. During the qualifiers for the 1980 European Championship, the Republic of Ireland took on Northern Ireland in a historic first ever meeting between the two sides. A 0–0 draw at Dalymount Park was marred by rioting in Dublin on the day of the match. Domestically, no team really dominated as the popularity of the game began to diminish. The major achievement was Dundalk's progress to the last 16 of the European Cup in 1979 when they eventually went out to Glasgow Celtic. The domestic game went from bad to worse during the 1980s with clubs all over the country struggling for finance. Shamrock Rovers were forced out of their home, Glenmalure Park, while St Patrick's Athletic were forced to move out of Richmond Park towards the end of the decade although they subsequently returned in 1993. On the field, Shamrock Rovers were again the team to beat as they won a record four titles in a row, though provincial clubs Athlone, Dundalk and Derry City also claimed titles. The 1990s saw an improvement in the game domestically. Facilities at grounds throughout the country improved, as did the standard of football. Shelbourne and St Patrick's Athletic dominated the decade, winning four league titles between them, with Shelbourne also winning three FAI Cups. The national game received a huge boost when the Republic, under Jack Charlton, qualified for the 1988 European Championship—their first ever major finals—where they won their first game 1–0 against England. This was followed by qualification for the World Cup in 1990, 1994 (where they beat Italy) and 2002. However, the Saipan incident, when the team captain Roy Keane went home (or was sent home) before the start of the 2002 World Cup after a public quarrel with manager Mick McCarthy over the facilities and preparation for the tournament, had far-reaching effects on the sport in Ireland. The FAI commissioned a report from external consultants Genesis, into its World Cup preparations. The "Genesis Report" agreed with many of Keane's criticisms, finding that the FAI structure was not conducive to good planning and making a range of recommendations. Brendan Menton resigned as FAI General Secretary at this time, and the media linked the two events, though Menton denied this. A second Genesis report, this time produced by the FAI but disingenuously called "Genesis II" (or the "White Paper"), in 2005 recommended a radical overhaul of the League of Ireland and led to the appointment of an assessment group. A joint implementation committee made major changes to the league, including merging the league with the FAI, changing the management structure and revamping the league structure. The League of Ireland entered its best ever era in the 2000s when Bohemians knocked Aberdeen out of the UEFA Cup and beat Kaiserslautern of Germany in the next round. A brief period of mixed results turned for the better in 2004. Shelbourne became the first team to get to the third qualifying round of the Champions League, where they knocked out by Spanish club Deportivo La Coruña 3–0 on aggregate. However, the league continued in improving results and thanks in part to Cork City making progress in the Champions League qualifiers, and Derry City beating IFK Gothenburg and Gretna in the UEFA Cup before falling in the final tie before the group stage. In 2008, it got its second best co-efficient in its history. The League of Ireland in 2007 was won by Drogheda United—their first ever league championship. The league entered difficult times along with the Irish economy during 2008 and 2009. In 2011 the League got the best co-efficient in its history as Shamrock Rovers made history by becoming the first Irish club to reach the group stages of the Europa League . It is currently ranked as the 31st best league in Europe out of 53. The league has scored at least 1.000 in every year since 2003, meaning it is currently in its best European cycle to date. The Republic of Ireland, Scotland and Wales are currently joint bidding to co-host UEFA Euro 2020. The Republic of Ireland football league system is formed of the League of Ireland and the 2011–12 FAI U19 League. The League of Ireland was established in 1921. The League of Ireland consisted of one division up to 1985, when it split into the Premier Division and First Division. In 2008, the A Championship was introduced below the league as a preparatory division for entry into it. The league season runs from March to November. Another change undergone by the league has been the introduction of professionalism into some clubs, and the majority of Premier Division clubs. Clubs were previously semi-professional. These changes were mainly made in an effort to better performances in European competition by League of Ireland clubs. The improvements provided by professionalism, particularly in fitness, produced significantly better results in European competition, but proved to be somewhat unsustainable for some clubs, with the vast majority of the clubs involved suffering severe financial collapses but these clubs have been outpassed by more financially stable clubs and the league has kept up its impressive performances. In 2006 the FAI completed a merge with the League of Ireland. This merge involved changes to league format which were to be gradually introduced over the next three years. The changes included the introduction of the A Championship which would provide non-league and amateur clubs a chance to win promotion to the First Division which, up to that stage, had no clubs actually relegated. Clubs who finished in last place had to re-apply for league membership, however. The league has received more media coverage in recent years. At the moment, two channels (RTÉ and TG4) show live matches and/or highlights of Premier Division games. The Premier Division currently contains 12 clubs. The 12 clubs play each other three times which gives a total of 33 matches each. The bottom placed club will be relegated to the League of Ireland First Division and the team who finishes in 11th position will enter a promotion/relegation playoff with a First Division qualifier. The League of Ireland First Division was introduced in 1985. Currently, there are 8 teams in the First Division, and they play each other four times, 28 matches each. The A Championship was introduced in the 2008 season as a new third tier, below the League of Ireland. The division was split into 2 separate groups competing independently of each other. The A Championship was replaced by the 2011–12 FAI U19 League in 2012. As of August 2016, the League of Ireland is 42nd out of 55 in the UEFA country coefficient. The League of Ireland's UEFA coefficient accumulates to a total value of 5.700 as of 2016. From 1998 to 2010, the league's place on the coefficient table rose 15 places, the highest of any league in Europe. However, since then, the League's ranking has fallen from its highest ever ranking of 29th in June 2010 to 42nd in 2016. Its position of 43rd in 2013/14 was also its lowest position since 1998. Three provinces in the country (Ulster, Munster, Leinster) run a league. These leagues are amateur leagues, though, and clubs cannot be promoted to the League of Ireland. Some of the top clubs in these leagues do compete in the FAI Cup, however. These leagues do not gain much media coverage certainly on a national level. Many counties in the country run a local league. These leagues do not provide promotion to provincial leagues but are still run. An example of one such league is the North Tipperary District Soccer League which is run in north County Tipperary. This particular league contains four divisions and also a youth division. The FAI Cup is the national cup competition of the country. It was first run in 1922. The tournament has a straight knockout format with non-league and junior sides competing in the first round before the league clubs join in the second round. The League of Ireland Cup is the other main cup in the country. It was first held in 1974. This tournament's format has changed over the years. Previously it had group stages in the opening round but it now is straight knockout but clubs are divided into regional groups in the opening rounds. All 22 league clubs take part with the addition of 2 non-league clubs in order to bring the number up to 24. League of Ireland clubs also competed in the Setanta Cup. This competition was played between clubs from both the League of Ireland and the Irish League in Northern Ireland. Six clubs from both sides of the border take part. Clubs who finish in the top four positions in the Airtricity League and Carling Premiership are invited to participate, along with the winners of both major domestic cup competitions. This tournament was first played in 2005 and has not been played again since 2014 with the next edition cancelled when fixture dates could not be agreed upon; clubs from the Republic won seven of the nine editions. From 2017, the Scottish Challenge Cup (for clubs playing below the top tier) invited clubs from Republic of Ireland to take part (Welsh and Northern Irish clubs were involved the previous year). Munster also run a cup for all clubs located in Munster including league clubs. Each of the provincial and local amateur leagues also run cup competitions for their league clubs. Premier Division club with the best UEFA Fair Play ranking that has not already qualified for Europe, but only if the Republic of Ireland has the best fair play ranking or has a fair play score of above 8 and is one of the two countries drawn out of the hat Only if the Republic of Ireland has the best fair play ranking or has a fair play score of above 8 and is one of the two countries picked randomly. The Republic of Ireland's first competitive international finished in a 1–0 victory against Bulgaria on 28 May 1924 in the Olympics. They have never won any major international competitions and had never qualified for a major tournament until 1988. Since then they have enjoyed relative success qualifying for three of the last seven World Cups. The furthest they reached was the quarter-final in 1990. Women's football is growing in the Republic of Ireland. The Women's National League (Ireland) was resurrected in 2011. There is a national team also which compete on an international basis. They are currently attempting to qualify for the European Championships in Sweden in 2013. Markets Field 3,200 Limerick F.C. Stradbrook Road 2,000 Cabinteely F.C. Croke Park, Thomond Park and the RDS Arena have been used as football venues during the construction of the Aviva. ^ "Social and Economic Value of Sport in Ireland" (PDF). Archived from the original (PDF) on 6 February 2009. Retrieved 5 February 2009. ^ "(Republic of) Ireland League Tables". RSSSF.com. Archived from the original on 21 February 2008. Retrieved 26 January 2008. ^ "Attendances – Eircom Premier League 2007". European-Football-Statistics.co.uk. Archived from the original on 27 September 2007. Retrieved 26 January 2008. ^ "United Irishmen: Manchester United's Irish Connection". Chris Moore. Retrieved 26 January 2008. ^ "World Cup 1990 – Match Schedule". PlanetWorldCup.com. Retrieved 26 January 2008. ^ Byrne, Peter (1996). Football Association of Ireland: 75 years. Dublin: Sportsworld. p. 22. ISBN 1-900110-06-7. ^ "League Tables". NTSL.com. Retrieved 26 January 2008.